Temperance Gossett married Butler Holcombe, son of Ozias Holcombe and Rachel Cornish, in 1793 at Litchfield, Herkimer Co., NY. Harriet Holcombe was born circa 1796 at Litchfield, Herkimer Co., NY.1 She was the daughter of Butler Holcombe and Temperance Gossett. Harriet Holcombe died before 1891. 1850 and 1860 census of New Haven, MI, unmarried and living with her sister Penelope Wheeler. In 1870 enumerated in the home of Phineas and Adeline Burch in New Haven. In 1880 living with her brother Elam in Brownville, Jefferson Co. NY. Humphrey and Penelope were enumerated in the 1850 New Haven, Shiawassee Co., MI, federal census. He was a farmer age 53, she was 47. Children in the household were Alonzo 14, and James 20. Also in the household was Penelope's sister, Harriet. Humphrey and Penelope were again in New Haven for the 1860 federal census. He was 63, she was 61. Children in the household were Edwin 35, and Alonzo 29. Sister-in-law Harriet 64 was still living with them. Possibly married Mary Jane Fuller. Possibly he that was enumerated in the Battle Creek Calhoun Co., MI, federal census; his age changes. In the 1850 census Hiram W., age 44, was enumerated with Maria 39, and Orson H. 17. In the 1860 census Hiram was 55, Maria, 49, Orson 30, Maria 27. Hiram 66 and Maria 60 were enumerated in the 1870 Pennfield, Calhoun Co., MI federal census. Hiram was 66, Maria was 60. Elam and Cornelia were enumerated in the 1850 Watertown, Jefferson Co., NY, federal census. He was a machinist, age 46; she was 32. Children in the household were Henry B. 19, James 17, Sarah 15, Julia M. 9, B. M. 7, Mary 5, and Elam S. 2. Elam and Cornelia’s ages are probably correct as they are consistent in the 1860 and 1880 census records. So are Henry B. , James, and Sarah children of Cornelia? With a gap before child Julia age 9, it could be Cornelia is a second wife. Elam and Cornelia were enumerated in the 1860 federal census, again in Watertown. He was superintendant of the water works, age 54, she was 41. Children in the household were Julia 18, Bernard 16, Elam 11, John 9, Hiram 4, and Albert 1 month. Elam and Cornelia were stil in Watertown for the 1870 federal census. He was a machinist, age 65, she was still 41. Children in the household were Birney 25, Elam 21, John 19, Elliot (Albert), 10; a female Nettie age 20 is listed next, because she is out of age order it may be that she is not a child of Elam and Cornelia. Elam and Cornelia were enumerated in the 1880 Brownville, Jefferson Co., NY, federal census. He was a machinist 75, she was 61. Ancestry.com reads her name as Pamelea or it can be read as Pamelia, but is certainly Cornelia. Also in the household are son Elliot A. 20, sister Harriet 84, granddaughter Mary E. 7, and grandson Willie K. 5. Amanda Holcombe was born in 1807 at Litchfield, Herkimer Co., NY.1 She was the daughter of Butler Holcombe and Mary L. Knight. Amanda Holcombe died before 1891. Miranda Holcombe was born in 1809 at Litchfield, Herkimer Co., NY.1 She was the daughter of Butler Holcombe and Mary L. Knight. Miranda Holcombe died before 1891. Michigan marriage records show a Meranda Holcomb m. William Durker 24 Dec 1833 in Oakland Co., MI; but there is no proof it is the same Miranda. Roswell Holcombe was born in 1811 at Litchfield, Herkimer Co., NY.1 He was the son of Butler Holcombe and Mary L. Knight. Roswell Holcombe married Evaline Farrar on 3 August 1834 at Oakland Co., MI. Roswell Holcombe died on 8 September 1843 at Atlas Twp., Genesee Co., MI. He was buried at Perry Mcfarland Cemetery, Grand Blanc, Genesee Co., MI. Stephen and Miriah were enumerated in the 1850 Oxford, Oakland Co., MI, federal census. He was a farmer age 41, she was 38. Children in the household were Thomas 15, Perry, 13, Mariah 8, Mary E. 6 and Hamilton 1. They were again enumerated in the 1860 Oxford federal census "S." was 5 and she was 47. Children in the household were Perry 23, Miriah 18, Mary E. 15, and H.S. 11. Thomas 26 and his wife Martha Ann 20, were next door. Daniel Holcombe was born in 1816. He was the son of Butler Holcombe and Mary L. Knight. Daniel Holcombe married Almira Farrar on 6 July 1834 at Oakland Co., MI. Daniel Holcombe married Prudence Brown Patterson on 25 September 1874 at Corunna, Shiawassee Co., MI.1 Daniel Holcombe died on 2 December 1875 at Shiawassee Co., MI. He was buried at Perry Mcfarland Cemetery, Grand Blanc, Genesee Co., MI. D. R. and Almira were enumerated in the 1860 Hazelton, Shiawassee Co., MI, federal census. He was a farmer age 54, she was 54. Children in the household were Mariah 16 and Perry 9. In 1870 Daniel and Almira were again enumerated in Hazelton. He was a farmer age 54, she was 54. Perry S. was 18. Could William have been married 3 times? William and Arvilla were enumerated int the 1860 Clarkston, Oakland Co., MI federal census. He was 34, she was 29. Children in the household were Alison 7, Willard 5, Butler, 4, Cela 2, Bela 3 months. Also in the household was his mother, Mary L. 73. William and Orvilla were enumerated in the 1870 Independence, Oakland Co., MI federal census. He was 45, she was 31. Children in the household were Allison 17, Willard 15, Butler 13, Celia 11, John 9, Flora 7, and Frederick 5. William and Lucy were enumerated in the 1880 Clarkston Village, Oakland Co., MI, federal census. He was a farmer 57, whe was 35. Children in the household were Charles 18, and Lilly 6. It seems that John who was 9 in the 1870 census, and Charles, who was 18 in the 1880 census are the same person. In the 1900 census he is listed as born July 1861. William and Lucy were again enumerated in Independence in the 1900 Federal census. He was 73, she was 54. Children in the household were Charles 39, and Lillian 26. [S25] Hannah McPherson, Holcombe Genealogy, page 163.1. Sterling and Eunice were enumerated in the 1850 census of Pittsfield Twp. Warren Co., PA, federal census as farmer, owning real estate, $1,600. He was 41, she was 33. Children in the household were Harriet 12, Arvilla 6, Parney 2, and Hiram 6 months. Sterling and Eunice Halcomb Jr. were enumerated in the 1860 Pittsfield, Warren Co., PA, federal census. He was a farmer age 50, she was 42. Children in the household were Lydia A. 15, Parney E. 12, Hiram E. 10, and Eva 7. Widow Eunice was enumerated in the 1880 Pittsfield, Warren Co., PA, federal census. She was 62. Children in the household were Orville 19, and Eva 27. Son Hiram was nearby. [S25] Hannah McPherson, Holcombe Genealogy, Page 163.1/Item A-8-1-6-3-8-2. Parney Holcombe was born in November 1847 at PA.1,2 She was the daughter of Sterling Holcombe and Eunice (?) Parney Holcombe married Elmer Stow. Parney Holcombe died in 1922. Elmer and Parnie were enumerated in the 1900 Harmony, Chautaugua Co., NY, federal census. He was a farmer, age 63, she was 52. The only child in the household was Sterling H. 19. Abial Eno Taylor was born on 14 August 1827 at Wolcottville, Torrington, CT. He married Flora Ann Holcombe, daughter of Harmon H. Holcombe and Sophronia Avery, on 16 April 1866 at New Hartford, Litchfield Co., CT. Abial Eno Taylor died on 18 February 1908 at Torrington, Litchfield Co., CT, at age 80. Albert Williams was born on 22 December 1828 at New Hartford, Litchfield Co., CT.1 He was the son of Douglas Williams and Sophronia Gibbs Holcombe. Albert Williams married Julia M. Loveland on 8 July 1851 at Loveland home, Colebrook River, Colebrook, Litchfield Co., CT. Albert Williams died on 14 October 1906 at Collinsville, Canton, Hartford Co., CT, at age 77.1 He was buried at Village Cemetery, Collinsville, Canton, Hartford Co., CT.
[S242] Seth P. Holcombe, Douglass Williams, Page 5, from gravestone. Julia Ann Williams was born on 13 October 1830. She was the daughter of Douglas Williams and Sophronia Gibbs Holcombe. Julia Ann Williams died on 7 April 1832 at age 1. [S25] Hannah McPherson, Holcombe Genealogy, Page 125.1/Item A-8-1-2-6-4-9-3. [S242] Seth P. Holcombe, Douglass Williams, Page 8. Eloise Baker Williams was born on 13 January 1856 at Pleasant Valley, CT. She was the daughter of Richard Lewis Williams and Susan Jane Doolittle. Eloise Baker Williams married Charles A. Cadwell, son of Birdsey Cadwell and Martha Neal, on 22 September 1875 at First Baptist Church, Southington, Hartford Co., CT.2 Eloise Baker Williams died in 1936 at Springfield, Hampden Co., MA.2 She was buried at South End Cemetery, Southington, Hartford Co., CT.
[S25] Hannah McPherson, Holcombe Genealogy, Page 125.1/Item A-8-1-2-6-4-9-3-1. [S242] Seth P. Holcombe, Douglass Williams, Page 19. Charles A. Cadwell was born on 1 June 1851 at Southington, Hartford Co., CT. He was the son of Birdsey Cadwell and Martha Neal. Charles A. Cadwell married Eloise Baker Williams, daughter of Richard Lewis Williams and Susan Jane Doolittle, on 22 September 1875 at First Baptist Church, Southington, Hartford Co., CT.1 Charles A. Cadwell died on 2 July 1929 at 5 Manitoba St., Springfield, Hampden Co., MA, at age 78. He was buried at South End Cemetery, Southington, Hartford Co., CT.
Lois Holcombe died on 14 March 1911. She was born on 14 March 1911. She was the daughter of Hiram Frank Holcombe and Mabel Florine Cadwell. Lois Holcombe was buried at South End Cemetery, Southington, Hartford Co., CT.
Mildred Williams Holcombe was born on 11 August 1914 at Springfield, Hampden Co., MA.1 She was the daughter of Hiram Frank Holcombe and Mabel Florine Cadwell. [S242] Seth P. Holcombe, Douglass Williams, Page 30. Lilia Ann Williams was born on 15 May 1835. She was the daughter of Douglas Williams and Sophronia Gibbs Holcombe. Emma Jane Williams was born on 21 April 1838. She was the daughter of Douglas Williams and Sophronia Gibbs Holcombe. Emma Jane Williams died on 25 September 1839 at age 1. Sophronia G. Williams was born on 1 May 1842. She was the daughter of Douglas Williams and Sophronia Gibbs Holcombe. Sophronia G. Williams died on 25 December 1863 at age 21. Douglas P. Williams was born on 15 May 1845. He was the son of Douglas Williams and Sophronia Gibbs Holcombe. Mary E. Williams was born on 18 October 1847. She was the daughter of Douglas Williams and Sophronia Gibbs Holcombe. Mary E. Williams married Samuel Benjamin Jr., son of Samuel Benjamin and Ascenath Holcombe. Children of Mary E. Williams and Samuel Benjamin Jr.
[S25] Hannah McPherson, Holcombe Genealogy, Page 125.1/Item A-8-1-2-6-4-9-8. Schuyler P. Williams was born on 30 May 1849. He was the son of Douglas Williams and Sophronia Gibbs Holcombe. Howard Williams was born on 2 January 1853. He was the son of Douglas Williams and Sophronia Gibbs Holcombe. Howard Williams was born on 7 January 1853. Mrs. Emily Merril Johnson Holcombe, widow of James H. Holcombe, died yesterday in this city. She had been slightly ailing for a day or two but nothing serious was apprehended until a few hours before her death, when her heart suddenly became inactive. She was born in this city, November 26, 1824, daughter of the late General Nathan Johnson and Sarah Butler Merrill -- one of a large family of children born in the old Merrill homestead on Main street near Grove. Her maternal grandfather, who lived in the same house, was Dr. Hezekiah Merrill, city treasurer when Hartford was incorporated as a city in 1784, and holding the position until his death in 1801. He was also the first cashier of the old Hartford Bank, the first bank established in 1782, his brother-in-law, Major John Caldwell, being the first president. His wife was Catherine Collier, grand-daughter of both Joseph Wadsworth, who hid the famous charter in the oak, and Lieutenant Colonel John Talcott, who is said to have been Wadsworth's companion in the daring act. Mrs. Holcombe's father, General Nathan Johnson, was an officer in the War of 1812, and later occupied a leading position at the bar in Harford, and was a conspicuous figure in the military operations of the city for many years, commanding the troops which gave a welcome to Lafayette. He was a graduate of Yale College in 1802, was state senator and was universally respected and beloved. He married Sarah Merrill and this was the first marriage performed by Rev. Dr. Hawes. Mrs. Holcombe was one of the oldest members of the Center Church, having joined that organization in 1842, and in this church she had an unbroken line of ancestors dating back to the founding in 1632. She married a well-known lawyer, the late James H. Holcombe, in 1844, going a bride to his residence on Lord's Hill, still occupied by their son, John M. Holcombe. In 1873 Mr. and Mrs. Holcombe and their eldest son, James Winthrop Holcombe, went abroad, where Mr. Holcombe died in 1889 and her son, James Winthrop in 1909, at which time Mrs. Holcombe returned to Hartford. She was a woman of marked literary ability, her letters from Europe being of such a charming character that a publication of them was planned some years ago, but she had a very retiring disposition and always avoided publicity. She was a devout Christian and her Bible was truly her daily companion. She was a woman of most gentle and attractive personality. Her brother, the late Charles W. Johnson, died in 1901, and a sister, Miss Sarah Butler Johnson, in 1902. She is survived by two sisters, the Misses Harriet and Laura Johnson, one son, John Marshall Holcombe, and three grandchildren, Harold Goodwin Holcombe, John Marshall Holcombe, Jr., and Miss Emily Margueritte Holcombe. The funeral will be at the residence of her son, John M. Holcombe, No. 79 Spring street, Friday afternoon at 4 o'clock. Rev. Dr. Rockwell Harmon Potter, pastor of the Center Church, will officiate and the burial will be in Spring Grove Cemetery. James Winthrop Holcombe was born on 3 February 1846 at Hartford, Hartford Co., CT. He was the son of James Huggins Holcombe and Emily Merrill Johnson. James Winthrop Holcombe died on 26 June 1909 at Isle of Capri, Italy, at age 63. He was buried at Isle of Capri, Italy. Upon graduating from Yale in the class of 1868, James was engaged in literary work and teaching for several years. During this time he contributed to various periodicals and translated a work of Jules Verne entitled "In Search of the Castaways" which was published by Lippincott. In 1872 he went around the world and shortly after his return to America went again to Europe, this time with his parents and sister, where he lived until his death, devoting the greater part of his time to taking artistic photographs in various countries for which he gained a good deal of a reputation and received medals from cities in England, Italy and America. He also spoke fluently French, German and Italian and played extensively on the piano and flute. Unmarried. 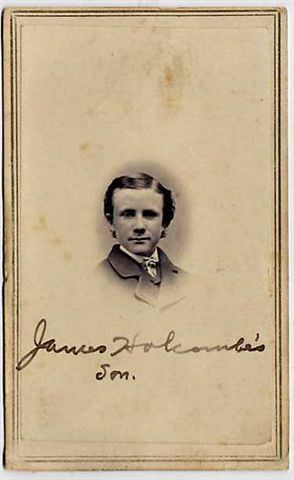 The picture of James could, in fact, be that of his brother, John Marshall Holcombe. John Marshall Holcombe was born on 8 June 1848 at 79 Spring St., Hartford, Hartford Co., CT.5,6 He was the son of James Huggins Holcombe and Emily Merrill Johnson. John Marshall Holcombe married Emily Seymour Goodwin, daughter of Edwin Olmsted Goodwin and Hannah Harriet Brown, on 28 January 1873 at 187 Cumberland St., Brooklyn, NY; at the bride's home.6 John Marshall Holcombe died on 15 January 1926 at 79 Spring St., Hartford, Hartford Co., CT, at age 77.5,6 He was buried at Ancient Burying Ground, Hartford, Hartford Co., CT.
Parts of the following from: Ancestry.com. Genealogical and Family History of the State of Connecticut, Vol. I [database online] Provo, UT: Ancestry.com, 2002. Original data: Cutter, William Richard Genealogical and Family History of the State of Connecticut: A Record of the Achievements of Her People in the Making of a Commonwealth and the Founding of a Nation. New York, NY: Lewis Publishing Company, 1911. After attending the Hartford Public High School, John M. Holcombe graduated from Yale in 1869 with the degree of Bachelor of Arts. Mr. Holcombe took a thorough course in law but early turned his attention to life insurance. His first position was in the office of the Connecticut Mutual Life Insurance Company, whence he was called to act as actuary of the state insurance department. His connection with the Phoenix Mutual Life Insurance Company dates from 1874, when he was made assistant secretary. The following year he was promoted to be secretary and continued in that position until chosen vice-president in 1889. December 28, 1904, he was elected president, which office he now holds. His writings, lectures and addresses have given him a national reputation in the world of finance and of insurance. One of the promoters of the insurance course at Yale, he has been a lecturer there ever since the course was established. Life insurance with him always has been a subject for deep study and most scientific research and investigation. He was one of the earliest members of the Actuarial Society 1251 of America, and his advice frequently has been sought and freely given in matters of import under consideration by insurance commissioners and other state officers and by legislators. This notably was true at the time of the New York investigation in 1902 and at the passage of the New York state laws emanating therefrom. His own company at that time of great stress received the highest commendation. He received an honorary degree from Trinity College, Hartford in 1920. He was elected to the Board of Aldermen in Hartford, to which board later his son, J.M. 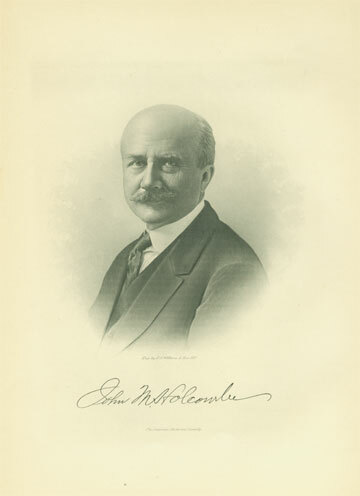 Holcombe, Jr. was also elected; later his grandson, Harold G. Holcombe, Jr., became the third republican generation to serve in the same capacity, representing the same district and living at the same address: 79 Spring Street, Hartford. He enjoyed golf and fishing, as well as exploring on old dirt roads in the Columbia car. Mr. Holcombe’s interest in public affairs has been manifested in many ways. He has been member of the court of common council, and presiding officer of both branches thereof. He was the originator of the Hartford board of health and served as commissioner for several years. He was also a member of the Hartford board of finance. Outside of the Phoenix Mutual Life Insurance Company he is identified with several financial and philanthropic institutions. He is a director of the Fidelity Trust Company, of which he was president from 1896 to 1907. He is a director in the American National Bank, the Mechanics' Savings Bank and the Connecticut Fire Insurance Company. He is treasurer of the Hartford Retreat for the Insane, has been president of the Hartford Municipal Art Society and of the Yale Alumni Association of Hartford, and is now chairman of the Yale Loan Fund of that association. He is a member of the Society of Colonial Wars, of the Sons of the American Revolution, of the Society of the War of 1812 and of the Society of Colonial Governors, of the Hartford Club and of the University Club of New York. In religion Mr. Holcombe is a Congregationalist, thus preserving the creed of his forefathers, and continuing through successive generations an unbroken line of membership in the ancient First Church of Christ in Hartford. Since her marriage Emily has been prominent in the social life of Hartford. She organized the Ruth Wyllys Chapter, Daughters of the American Revolution, and was its first regent, which office she still occupies. The chapter, by unanimous vote, removed the term limit from this office as long as Mrs. Holcombe would remain. In the chapter's patriotic movement to save the ancient and historic burying ground of Hartford , Mrs. Holcombe accomplished a great public improvement. It was she who conceived a plan for the widening of Gold street, to remove the row of disreputable tenement houses and make the dirty and disgraceful alley into a fine street, and secure to the historic cemetery cleanliness, light, and a conspicuous position in the center of the city. A similar work, though much less extensive, had been previously attempted resulting in complete failure. Mrs. Holcombe received the cordial support of the chapter, official boards, and the public, and contributions were generously made. Delays occurred and appeals from property assessments were made to the courts, but at this period of discouragement Mrs. Holcombe was always hopeful. She overcame all obstacles, and carried through the undertaking with a sagacity, diplomacy and brilliancy of execution which won her the thanks of the citizens of Hartford, and a position of prominence in the state. She was the central figure on the celebration of the event at the grounds, June 17, 1899 , on which occasion, she, as regent of the Ruth Wyllys Chapter , and originator of the plan, delivered an eloquent address in presenting to the mayor of the city the deeds of certain parcels of land. She was presented with a loving cup by Mrs. William H. Palmer , vice-regent, in behalf of the members of the Ruth Wyllys Chapter. At a banquet given on the evening of that day by the historic Putnam Phalanx, one of the speakers said: "If there is a society in Connecticut that deserves to be honored, the Daughters of the American Revolution is that society, and if there is a woman who should feel happy to-night, Mrs. John M. Holcombe is that woman." General Hawley suggested a toast to Mrs. Holcombe , and all present rose. John M. and Emily were listed in the 1916 Hartford City Directory at 79 Spring St., Lord's Hill. He was President of Phoenix Mutual Life Ins. co. at 49 Pearl St. John M. Jr. was listed as a clerk, Phoenix Mutual Life, also living at 79 Spring Street. John and Emily were enumerated in the 1920 Hartford, Hartford Co., CT, federal census (ED 74) at 79 Spring Street. He was 71, she was 67. Children in the household were Emily 32, and John 30. (T)hey had three children: Harold Goodwin Holcombe, in the insurance business in this city; Miss Emily Marguerite Holcombe, and John Marshall Holcombe, Jr., manager of the Life Insurance Sales Research Bureau of this city. There are also nine grandchildren. Mrs. Holcombe died March 28, 1923, and is buried in the Ancient Burying Ground, in the rear of the Center Church, on Gold street, in the work of restoration of which she was active. Two years previous to Mrs. Holcombe’s death they celebrated their golden wedding at their home in this city. Mr. Holcombe’s funeral will be held at his home, No. 79 Spring street, at 2 o’clock Monday afternoon, Rev. Warren H. Archibald of the South Congregational Church and Rev. Quincy Blakely of Farmington, officiating. The body will be placed in the vault at Spring Grove Cemetery, and will later be buried in the Ancient Cemetery. Authority for the burial of Mr. and Mrs. Holcombe in this cemetery was granted by special act of the common council in June, 1923, this vote authorizing the park commissioners to permit not more than two burials there. The honorary bearers will be President Archibald A. Welch representing the Phoenix Mutual Life Insurance Company, President Edward Milligan of the Phoenix (Fire) Insurance Company; President Robert R. Newell of the United States Security Trust Company; Treasurer Wickliffe S. Buckley of the Mechanics Savings Bank; former Governor Marcus H. Holcomb; Dr. Ernest A. Wells; President Leon f. Broadhurst of the Phoenix National Bank and President Willis B. Joyen of the National Surety Company of New York. The active bearers will be Howard Goodwin, C. W. Johnston, Albert Y. Yost, M. C. Carroll, Russell Lee Johns and Charles Welles Gross. [S75] Holcombe. Seth P., Phineas Holcomb, Page 35/Item 19. [S187] Committee on Publication, Connecticut Sons of the Revolution, Page 121. [S25] Hannah McPherson, Holcombe Genealogy, Page 123.2/Item A-8-1-2-6-4-1-1-2. William Howard Holcombe was born on 3 January 1851 at Hartford, Hartford Co., CT. He was the son of James Huggins Holcombe and Emily Merrill Johnson. William Howard Holcombe died on 3 July 1852 at Hartford, Hartford Co., CT, at age 1. He was buried at Spring Grove Cemetery, Hartford, Hartford Co., CT.
Emily Johnson Holcombe was born on 26 May 1857 at Hartford, Hartford Co., CT. She was the daughter of James Huggins Holcombe and Emily Merrill Johnson. Emily Johnson Holcombe died on 13 May 1859 at Hartford, Hartford Co., CT, at age 1. She was buried at Spring Grove Cemetery, Hartford, Hartford Co., CT.